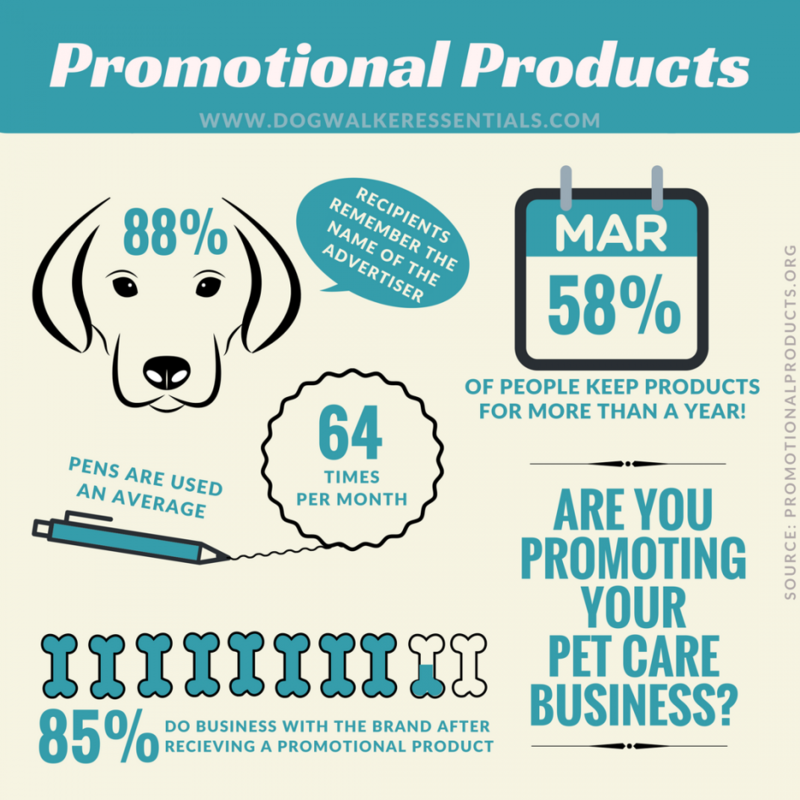 If you own any type of pet care business I highly recommend incorporating promotional products into your marketing strategy. Promo items spread the word, create a positive brand image, and help generate new customer leads. When customers use promo items, they give other people a look at your businesses logo, and that just keeps generating interest. It’s the Circle of Promotional Life, you know? When I first started out I had way too much fun giving out poo bag dispensers and pens. I also had plenty of promotional items to create really festive gift baskets for local fundraisers and rescues. I also used these promotional products to introduce myself to local groomers, trainers and vets; everybody loves free stuff and it showed a level of seriousness and professionalism as a legitimate business. I have put together everything I have used to take my business to the next level over the years. Full disclosure, I did not buy these all at once but collectively as my business grew. **Scroll to bottom for exclusive coupons to InkHead! Branded clothing is the easiest way to market your business; with an eye catching fun logo people will automatically ask you questions. I started adding “Dog Walker” to the back of my shirts where a last name would go on an athletic shirt and it never fails someone always asks about it. I wear my branded t-shirts to Jazzercise (yes, I jazzercise and it’s a great time) all the time and I have gotten multiple clients out of it. Always, I repeat, always have business cards on hand they are the first impression of your business. Despite advances in technology, they remain a useful tool for personally connecting with potential clients, vets, groomers, local trainers and animal rescues. Business cards enhance the legitimacy of your business, help facilitate the networking process, strengthen brand awareness, and give an image to your business. To take it a step further I use plastic display holder’s to give a more professional appearance. I prefer a a concise creative rack card over a brochure because rack cards allow you to truly spotlight what’s important=your services. I like having rack cards for people who ask “what services do you offer?” It is small enough to throw in a purse/pack but big enough not to forget about. I also like to display these on any local community boards. I use a professional plastic holder for these too. One of the most versatile and affordable types of marketing materials are flyers. The best thing you can do with flyers is target your audience; I specifically use these for parent packets at schools, apartment complexes, condos and all fundraising events. I give a welcome folder to every client; it has a copy of my service agreement, business code of conduct, a rack card, business card, a magnet, login credentials for my software, and a hand written welcome note. I bought a bunch of inexpensive folders then went to Office Max and had stickers made of my logo= fancy. Full disclosure- I have these but I really hate putting them around my neighborhood because everyone in my area really does not like “solicitors” (Yes, I know I would not technically not be soliciting but according to the secret FB page for my little city I would be, don’t ask). However, your area may different and door hangers could easily get your target audience to take notice of your company. People love free stuff and it is fun to give things away. Going into business I set aside a pretty large amount of money to purchase promotional products to really saturate my area and I truly believe it made a difference. When researching products to purchase I avoided all branded dog toys because 9 times out of 10 they get destroyed by the pup= waste of money. I like to find something that serves a purpose, has a function, used frequently and can be seen by other people when in use. If your looking to buy just one item to begin with then I have had the best luck with poo bag dispensers, pens, and magnets. This has to be my clients favorite “gift”. All vacation clients get a little baggy of goodies and I always include a branded poo bag. Not to mention whenever they walk their dog they are basically giving you free advertisement. I always throw in a couple extra rolls of poo bags too. These are great to leave at rescues too. I love these- I especially love seeing my branded magnet displayed on my client’s refrigerators. The magnet becomes a decoration, and any marketing piece that involves your brand in that kind of longevity is well worth the small investment! The only downfall to these is they are a bit on the thinner side and if they get folded then they do not stick well. This is a no brainer to me, everyone LOVES pens. Yes, there is a cost to creating promotional pens, but this marketing tactic is by far the most cost-effective one available. Promotional pens are sold in bulk, and the cost per pen is very affordable. People may not always need you services right away but if they develop a need in the future, your company may be the first one that pops into their head. Pens are easily the most functional promotional product out there. Everybody uses carabiners- they are literally the most multi functional little pieces of strength. I recently made the investment to get these and I do not regret it! Bonus: I gave them out to all my walkers and their families to use too. I did not buy these but am considering it, they would serve a great purpose! A local trainer was giving these food bowls out and people really seemed to like them. This would be a great giveaway for clients who hike or perhaps any pet professional who does long pack walks and needs a water bowl=extra branding is always a bonus. These food scoop/clip combo’s were worth the price and I get a lot positive feedback from clients. I bought these for Christmas gifts for my daily clients a couple years ago and they were a big hit and very useful! Also every couple months I drop off a few to my local pet stores and tell them to give them away to customers with new puppies buying puppy food. If you haven’t noticed by now, I like to take a guerrilla marketing approach to getting my business out there. I have zero regrets about this strategy. Ready to take the plunge and buy promotional products for your pet care business? Magnets are a bit washed up, I prefer something usable, like a food bowl.